Check out the video tutorial for this here. So many people have asked how to do this easy project. You will be so proud to open up your purse, it's worth the hour of time to make one. You can also do this project with a non vintage purse, but it works better with the stiff construction of these 1950'ish babies! First, you are going to get everything that you want to carry in your purse. I carry a hairbrush, lipstick, phone, ink pen, debit card, powder for my oily nose! Then, get your stabilizer, cut a piece to fit the side of your purse. You can measure or trim and fit as you go. I find it's best to trim and fit. Slide the stabilizer along the back wall of the purse. It should fit snugly but not bow out of place or be so loose that it slides back and forth. The top of the stabilizer should reach to the top of purse ,but, you should be able to shut your purse without it getting in the way. Shorten it as necessary. Now that you have it fitting well, make one for the other side of your purse (the sides of these old purses may not be identical so be sure to make one for both sides). You should have two pieces of stabilizers that fit into your purse side walls. Slide them in and shut your purse checking to see if they are fitting how you want! Next, it's time to sew. Cut a piece of fabric about one inch all around larger than your stabilizer. Tuck and pin fabric to back of your panel of stabilizer. Sew around edges about 1/4 of inch in. Check to make sure your stabilizer panel still fits. Okay, now is the fun part. Decide how you want your purse set up. Do you want your lipstick front and center or your phone in the middle? Arrange your items. Maybe you want your makeup type items on one side and your cell phone on the other. You decide! Use some Scotch tape to put items into temporary place. Now slide your panels with your taped items into your purse. Do they fit? Can you shut your purse well? If not, rearrange your items. I know my sun glasses and my cell phone should not be across from one another or my purse won't close. Once you have the perfect placement, take the tape off and remove your items. Take a piece of fabric at least twice the length of your stabilizer and half the height of your panel. So if your panel is 15 long by 10 inches high you will need a piece of fabric that is 30 inches long by five inches high. Finish off the top edge of your fabric strip. You can turn the edge over and sew or you can get fancy and put some seam binding on the edge for a decorative touch. Next, you are going to sew around your items creating pockets. Start with the item farthest to the left. Place item down and sew top to bottom. Be sure to give your item room to move a little. All your pockets should be tight enough, but not so tight you can't remove your item or put it back without a lot of effort. Go slow and relax! This is a trail and error period but you'll get there. Get a good steam ripper ready! Do not worry about putting the bottom seam in yet. Take your next item and sew it into place and then the next until finished. Now, gather up fabric on bottom, wrap it around to the back of panel. Don't pull too tight or your item will ride up and won't fit. Also, you want to be able to grab your items, so try to keep the fabric low enough so they stick out of the fabric a little. Make pleats and pin into place, check to make sure your things fit, if they do, sew it up and your done with your panels. Finally, take your mounting tape and place a piece on back of your panel on each corner and one in the middle. This tape works really great! It's still holding after a year! The best part is no damage to the purse itself. Tweak whatever you need to and cut off loose thread! Once you get this down you can get fancy by making a two tier panel or adding a horizontal pen holder. Get creative! 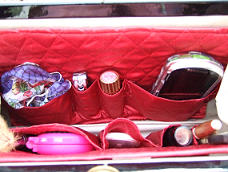 Enjoy the good feeling of having a organized purse! this is so smart! Of course everyone has seen the modern purse organizers, but this really solves a problem for vintage purse lovers. Thanks! What a fabulously novel idea! And that pastel blue bag....divine! How very pretty & practical at the same time! I linked to this from my blog, hope that's ok! Hi Alessa No problem, link away! Have a happy vintage day! Thank you so much for your ingenuity! I have recently re- discovered my love of vintage purses and wondered how I was going to get all my modern stuff into them. I stumbled upon your tutorial and made an insert right away. I just now inserted it into my vintage purse. Lisa Awesome! I a so glad you made one. It's a great way to use the vintage purse. I have found along way that using lighter (in color), heavy fabrics and making pockets tall and wide is most helpful for keeping things into place! Great post, I generally have quite dis-handbag organizer but I do also carry round a measuring instrument and a listing of measurements of varied nooks and crannies of my house just in case} I come across the right thing on my travels, glad I'm not the sole one! Welcome, friends! Enjoy your visit! Sew your own customized organizer. See how you can do it in about an hour! All things quilty... and sewy.